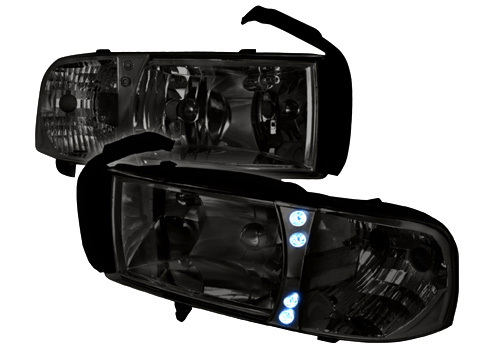 Spec-D Smoked LED Headlights 94-01 DODGE RAM Spec-D Smoked LED Headlights 94-01 DODGE RAM, Smoked LED Headlights 94-01 DODGE RAM, LED Headlights 94-01 DODGE RAM, Smoked Headlights 94-01 DODGE RAM, Spec-D Headlights 94-01 DODGE RAM, Headlights 94-01 DODGE RAM, Spec-D 2LH-RAM94G-RS Lights, 94-01 Dodge [Spec-D 2LH-RAM94G-RS Lights] - $119.95 : 3rd Strike Performance, Your Source for Late Model MOPAR Performance Parts and Accessories! Spec-D is truly going against the industry norm with it's Euro Style Headlights for the Dodge Ram. By providing a phenomenal looking headlight, all while keeping a price you can be happy with, Spec-D is reshaping the way Dodge Ram accessories are handled. Available with various lens finishes such as black, clear, or smoke, you can choose a set of headlights best suited to your Dodge Ram's personality. Spec-D's euro headlights are designed to exactly replace your current factory lights all the way down to the wiring. No additional fabrication is required as these headlights are fitted to your Dodge Ram's exact specifications making installation easier than ever. With a modern and cutting edge look, Spec-D is the brand to put your faith in. Spec-D takes every measure to guarantee that your euro headlights are DOT approved, eliminating any concerns while out on the road. Each euro headlight set has been weather-sealed to easily combat the harshest weather conditions mother earth can throw your way. Select models come equipped with LEDs depending on Dodge's model and year range to the refined European look one step further. A multi-faceted reflector, matched with a high quality lens, guarantees the brightest illumination available to greatly enhance your viewing capabilities at night. Spec-D provides a 90-day limited manufacturer warranty. Spec-D has revamped the way people view headlights, all while maintaining the highest quality and style possible. Spec-D is a brand committed to nothing short of excellence and that is a fact easily apparent in it's products. If you are looking to improve your nighttime driving visibility, while also upgrading the appearance of your Dodge Ram, then be sure to pick up your set of Spec-D euro headlights today!